The kind of westerns I liked as a kid and young adult might broadly be called "alternative Westerns" or maybe even "anti westerns" because they were pretty far removed from the John Ford/Howard Hawks cowboys versus Indians type of thing. Sergio Leone's westerns were written by an Italian, scored by an Italian (the scores were very important) and filmed in southern Spain. I've heard people rail against Leone's work saying that they're not proper westerns but that was fine with me. Stylish, weird, with odd dubbing and good music Leone made me interested in the genre for the first time. Arthur Penn's The Missouri Breaks and Little Big Man also cd be considered alternative westerns. And lets not forget Sam Peckinpah's masterpieces: Pat Garrett and Billy The Kidd & The Wild Bunch. The great David Peoples' script for Unforgiven also has a certain left field quality to it. But really it was Jim Jarmusch's Dead Man starring Johnny Depp that got the whole ball rolling in this genre. Existential, slow, strange and fascinating Dead Man is a movie you either love or are bored out of our mind by. Kelly Reichardt's terrific, slow, existential feminist western Meek's Cutoff also ploughs this Jarmuschian furrow. As do the Coens in their version of True Grit. 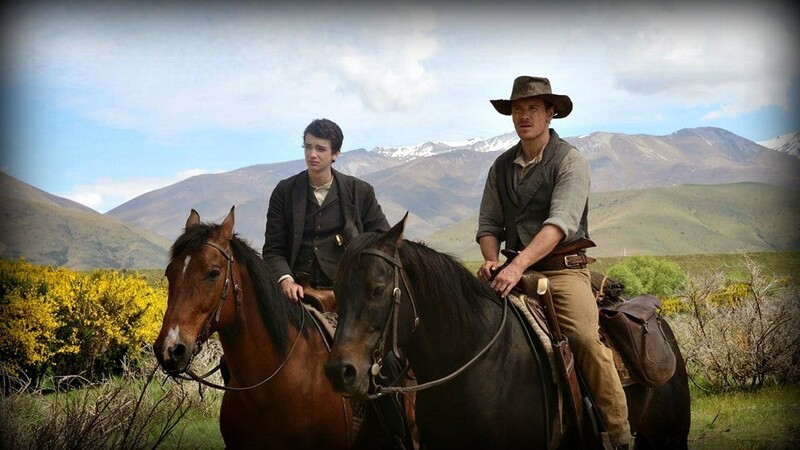 Slow West then is working in an established genre with a lot of heavy lifting to do to make it unique and interesting. It tells the story of, Jay, a young Scottish aristocrat (this important class dimension might be missed by some viewers) played by Kodi Smit-McPhee who is looking for his girlfriend in Colorado. She fled Scotland along with her father following a tragic incident that is told in flashback. Along the way Jay meets Michael Fassebender and they have the sort of incidents with the sort of oddballs you expect in an alternative western. I know this doesn't sound promising but somehow the whole thing works brilliantly. The movie is being deliberately provocative by calling itself Slow West - it isn't slow at all, its twisty and gripping and good. Bounty hunters are also after Jay's girl - Caren Pistorius - who looks like a young Jennifer Connolly and who was an absolute revelation in this part. Filmed in an only slightly annoying Jacksonian New Zealand (twenty minutes west of Christchurch by the looks of it), the first time director John Maclean does a terrific job making all the characters in the movie interesting. John McClane may have saved Nakatomi Plaza but John Maclean as well as being the keyboard player in the Beta Band (who I saw support Radiohead at Red Rocks) has a great career ahead of him as a director. The score's pretty interesting too.